These muffins are light and fluffy and delicious. They aren’t even very sweet, they’re just right. I’ve discovered the secret to making muffins is to not over mix them. You can’t use the electric mixer, just use a fork. Not a spoon, a fork. They take less than 10 minutes to mix up! Using a pastry cutter or a knife, cut in 1/4 cup of butter until the butter is the size of small peas. In a separate bowl beat 1 egg, then use a fork to whisk in 1 cup of milk. Add the milk and egg to the flour mixture and stir with a fork just until everything is fully incorporated. The batter should be lumpy. Don’t mix too much! Add in 2 cups of of washed berries and stir gently until mixed throughout. Use a well greased or paper lined muffin pan. 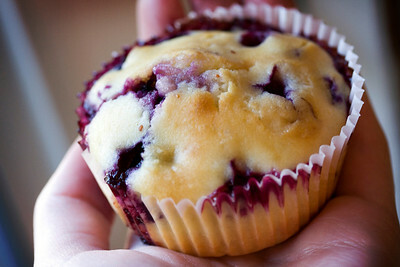 Fill each muffin space halfway. This makes about 20 muffins. Freeze the extras individually wrapped for quick breakfasts.